Steam Turbines shows how to select, improve, operate, and maintain high-quality mechanical drive steam turbines-with maximum efficiency and minimum downtime. 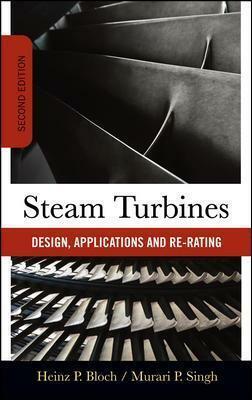 This new Second Edition offers authoritative information on the operating characteristics, design features, reliability, and maintenance of all steam turbines. A complete sourcebook, Steam Turbines delivers the expertise required to capitalize on the latest steam turbine and intermediate transmission unit innovations--and improve a plant's efficiency, availability, and profitability. Heinz P. Bloch is a consulting engineer. Before retiring from Exxon in 1986 after over two decades of service, Mr. Bloch's professional career included long-term assignments as Exxon Chemical's Regional Machinery Specialist for the United States. He has also held machinery-oriented staff and line positions with Exxon affiliates in the United States, Italy, Spain, England, The Netherlands and Japan. He has conducted over 500 public and in-plant courses in the United States and at international locations. Dr. Murari P. Singh is Consulting Engineer / Probabilistic Lifing Leader of GE Oil & Gas for all products in Chief Engineers' Office. Murari has been involved in the design, development and analysis of industrial turbomachinery for more than thirty years with Turbodyne Corporation, Dresser Industries, Dresser-Rand Company and, most recently, with Safe Technical Solutions Inc., where he served as Director of Engineering Technology. Dr. Singh has extensive knowledge and experience with fatigue and fracture mechanics, stress and vibration of structures, reliability, life analysis, and probabilistic analysis. His practical application experience includes a variety of rotating equipment including warm gas and FCC expanders, steam turbines, and centrifugal compressors. He developed the widely used SAFE diagram for reliability evaluation of turbine blades. Dr. Singh has authored more than 35 technical papers on topics relating to turbomachinery.